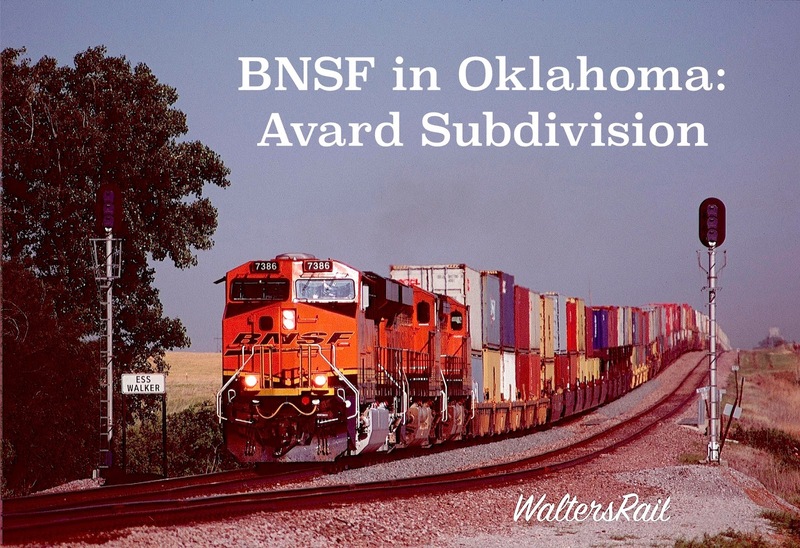 My first exposure to what is now BNSF’s Avard Subdivision occurred in the 1950’s, when my mother took my father and me to her family’s yearly reunions in Perry, Oklahoma. The gatherings were held in a tiny, clapboard house in which my mother’s paternal grandmother had raised six children after her husband died young and the family was forced to sell the farm and move to town. 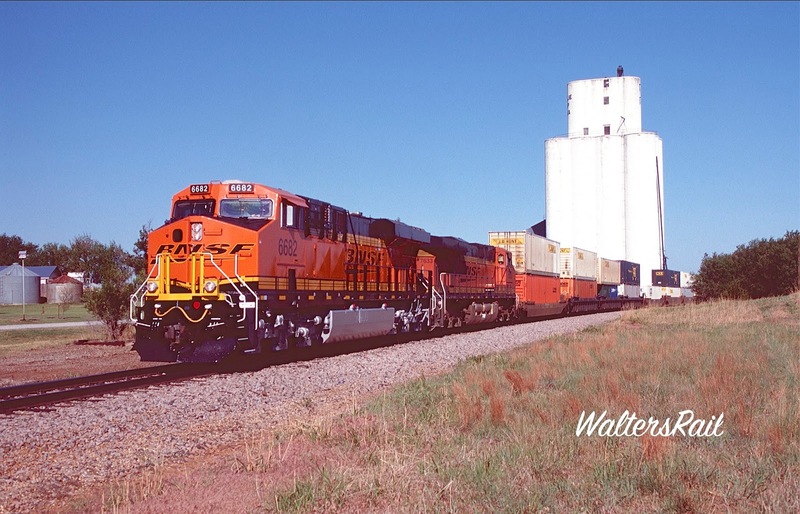 A Frisco branch line, connecting Tulsa with the Santa Fe transcontinental mainline, ran south of the house beside a grain elevator that towered over Perry like the Front Range over Denver. Sometime during the day, one small, local freight would trundle past, twenty cars or less, rocking from side-to-side on the dilapidated track. Today the tiny house has been torn down. The grain elevator still stands, though not so tall as it appeared to the eyes of a child. 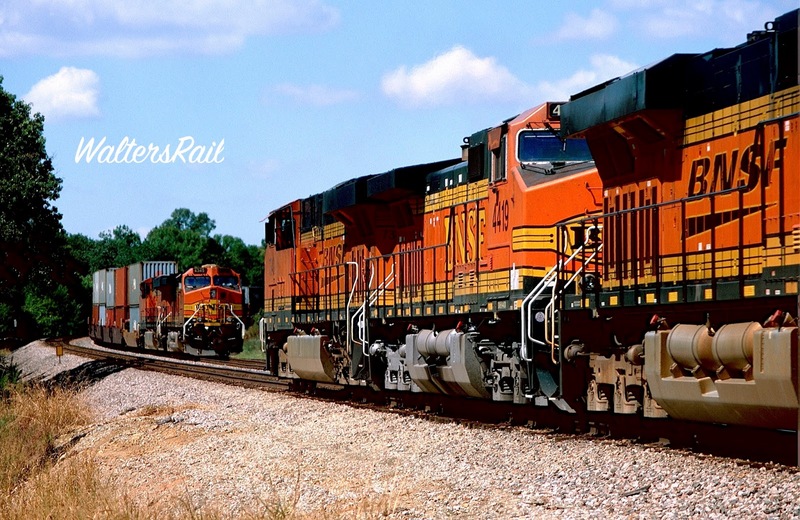 The railroad, however, has undergone a metamorphosis under BN and BNSF ownership. 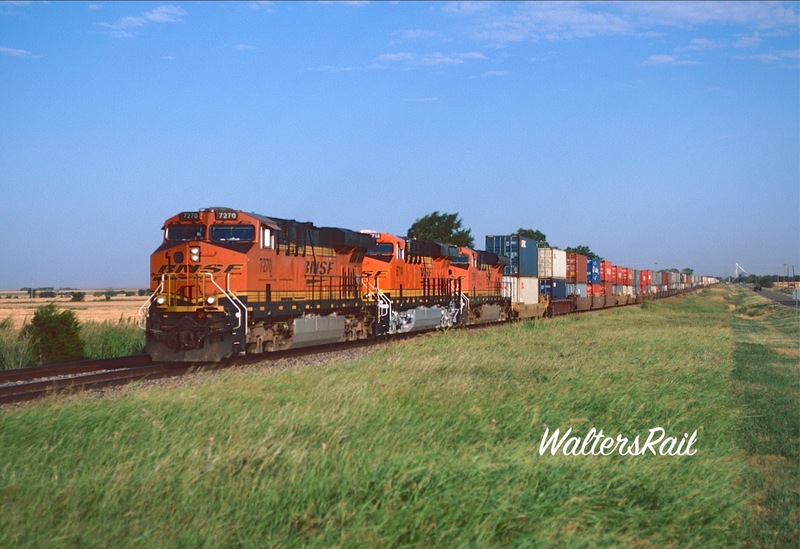 Instead of one lonesome local on a branch line, lengthy intermodal trains, carrying goods to and from the Pacific, now roar through Perry on BNSF’s Avard Subdivision. Following this unique line from Tulsa to Avard will take you from the geography of the eastern United States to the geography of the West in about 150 miles and show you almost every mainline operating practice imaginable. No other line I know of can make that claim. 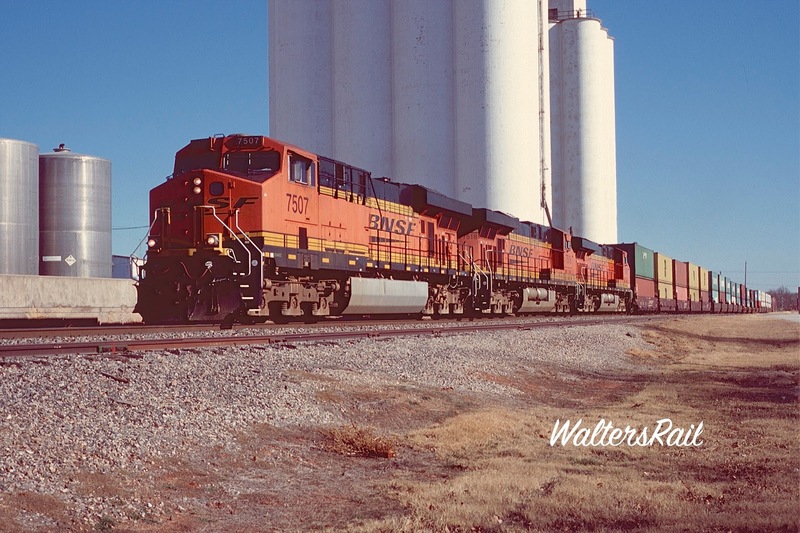 Westbound Stacks, Lead by an ES44DC, Roar Past the Grain Elevator in Perry, Oklahoma. 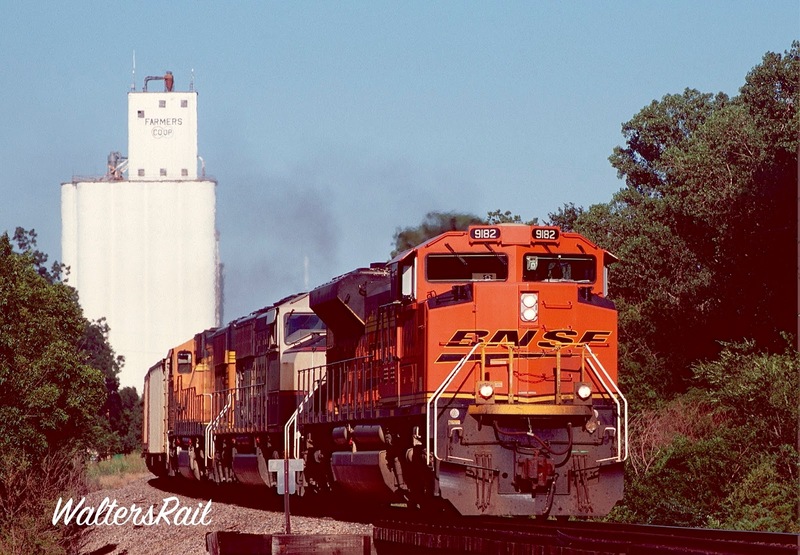 An Eastbound Manifest Passes the Perry Grain Elevator. Construction on the Arkansas Valley and Western Railway began in 1902 to link Tulsa with the Santa Fe’s transcontinental mainline. The line reached Enid, Oklahoma, in 1903 and Avard (the junction with the Santa Fe) in 1904. If you look at the railroad on a map, you will note that west of Perry, the line runs hard to the northwest, though construction due west would have produced a shorter route. The northwesterly direction is necessary to bypass the Gloss Mountains, a line of gypsum hills in northwestern Oklahoma that present something of a challenge to railroad construction. Building from northeast to southwest in 1887, the Southern Kansas Railway, which later became part of the Santa Fe (now BNSF) transcon, crossed one edge of this geologic formation at Curtis Hill on several curves and a ruling grade of one percent, so the builders of the Arkansas Valley and Western surely wanted to avoid the high construction costs involved in constructing a railroad line at that gradient. 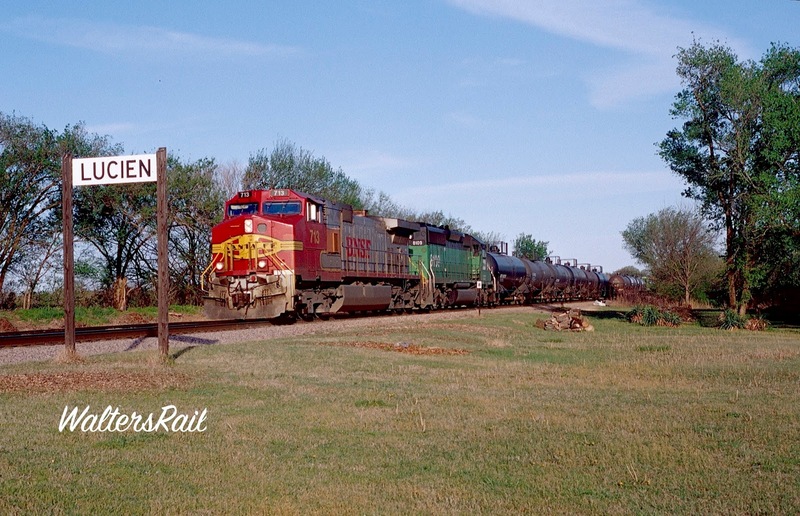 In 1907 the Frisco purchased the line and operated it until 1980, when the Burlington Northern purchased the Frisco. In late 1996, as we all know, the Burlington Northern formally merged with the Santa Fe and is now BNSF. While this line’s ownership has changed over decades, the route’s geography changes within a relatively small space. West of Tulsa, the line climbs from the valley of the Arkansas River and winds through the Osage Hills, which are almost mountainous. In the early 1960’s, the Army Corp of Engineers relocated part of the line during the building of Keystone Dam. The relocated route runs almost perfectly straight through the hills on massive fills and cuts, the same construction method used for interstate highways. 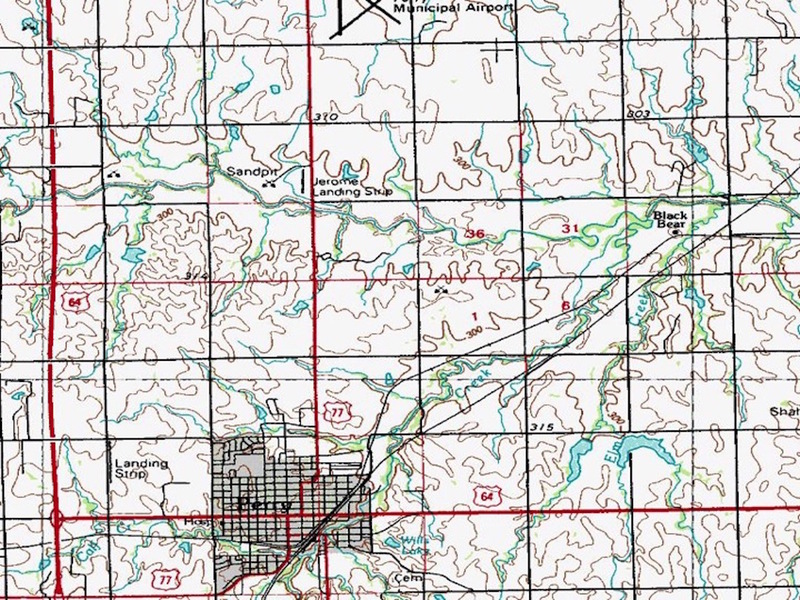 West of Mannford, a town also relocated out of the path of Lake Keystone, the track crosses the Cimarron River on a long, uncovered bridge, then angles northwest through more hills towards Pawnee. Northeast of Perry, the Avard Subdivision crosses BNSF’s north-south Red Rock Subdivision at Black Bear Junction. The two lines then run roughly parallel to each other into Perry, where the Avard route turns west and heads towards the High Plains. 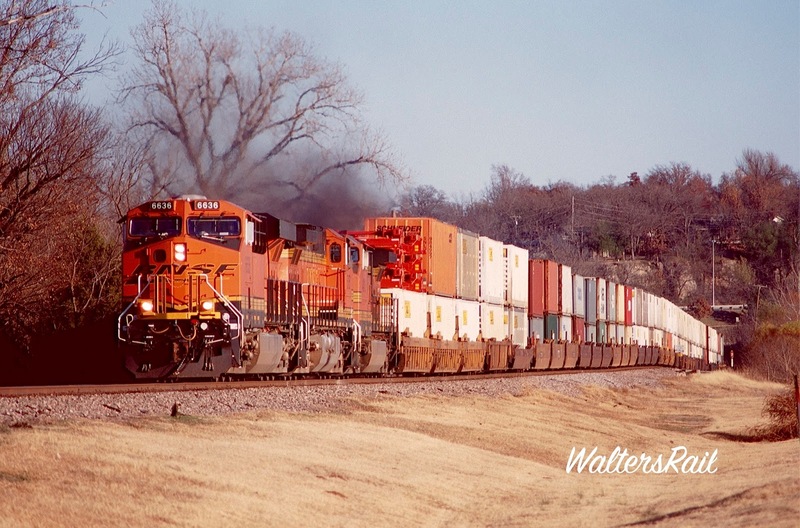 Below: BNSF 6636 East Climbs the Hills Out of Tulsa. 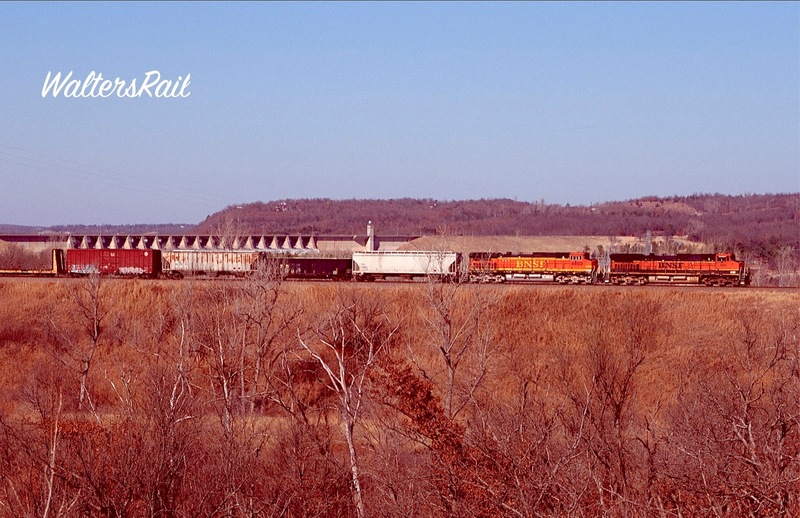 A Re-Routed Westbound Empty Coal Train Climbs the Osage Hills. An Eastbound Manifest Passes the Keystone Dam, Led by a C44-9W. A Rock Train at Same Location. Below: Eastbound Stacks Crossing a Small Arm of Lake Keystone. 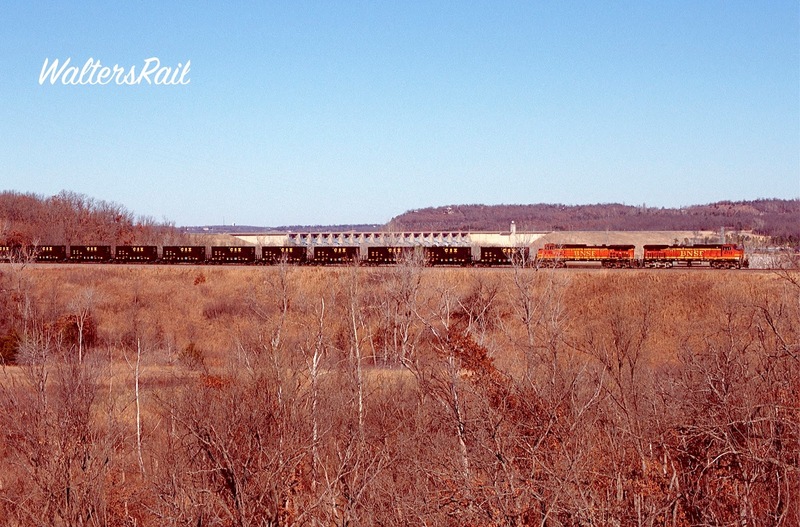 BNSF 7545 East Roars Along Realigned Route Straight Through the Osage Hills. There may be no other line in the United States in which the geography changes as rapidly as on the Avard Subdivision. In about 150 miles east to west, the terrain shifts from close, forested hills that look like central Tennessee to open wheat fields and grain elevators that look like eastern Montana. 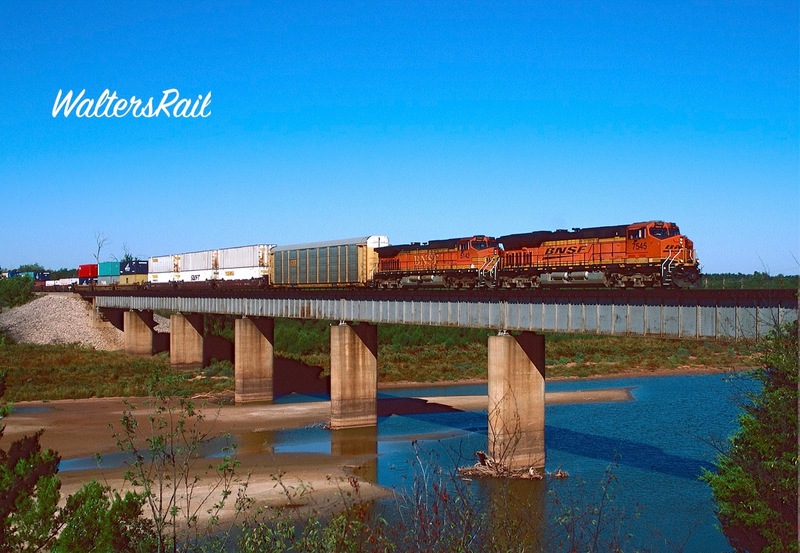 Leaving the valley of the Arkansas River west of Tulsa, for example, freights climb through sandstone cuts surrounded by oak forest. 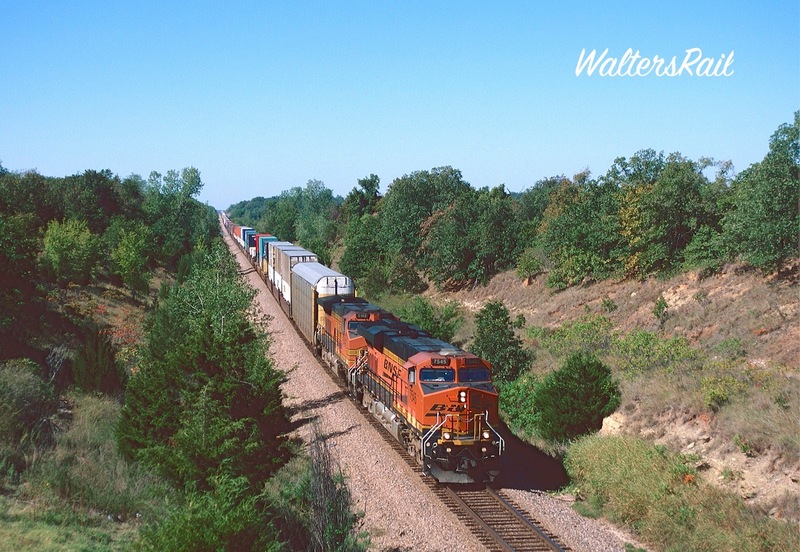 By contrast, on the western side of the line, near Carrier, trains negotiate an ocean of ripening amber wheat. The distance between the two locations is only about one hundred miles. Early in the 18th century, more than 60,000 members of the Pawnee Tribe inhabited the North Platt River in Nebraska. The Tribe then, as it is now, was composed of four distinct bands: the Chaui “Grand,” the Kitkehahki “Republican,” the Pitahawirata “Tappage” and the Skidi “Wolf.” After encroachment by white settlers, the Pawnees unwillingly ceded their territory to the U.S. Government and were removed from Nebraska to what is now Pawnee County Oklahoma in 1875. The Pawnee Indian Agency and an Indian boarding school named the Pawnee Industrial School were established just east of the present site of the City of Pawnee. The school, called “Gravy U” by locals, was closed in 1958 and the land was returned to the Pawnee Nation in 1968. Many of the former Industrial School buildings now serve as Tribal offices and as a home for the Pawnee Nation College. The Eastern Oklahoma Railway, which later became part of the Santa Fe, built a line through Pawnee between 1900 and 1902. In 1902, the Arkansas Valley and Western Railway (now the BNSF's Award Sub) also built a line through the city. The Santa Fe branch line was abandoned years ago. However, the portion of it through Pawnee is now used as a passing siding for the Avard Sub. 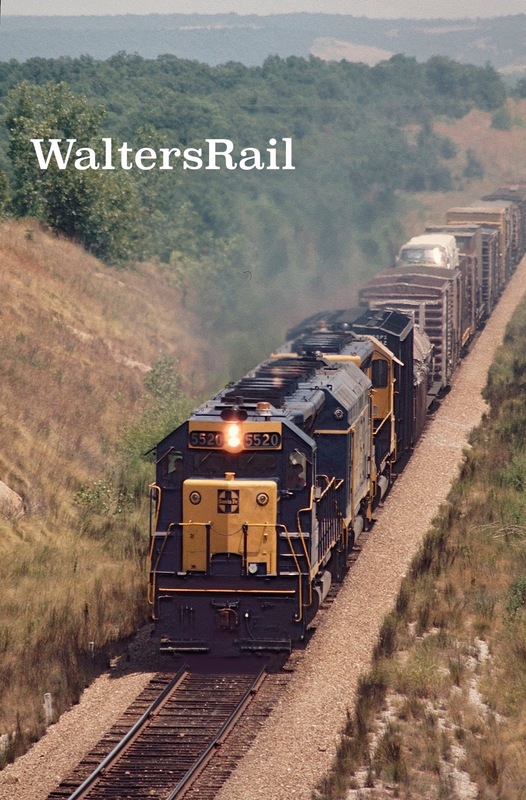 In the image above, westbound stacks are on the remaining portion of the old Eastern Oklahoma Railway. The mainline is barely visible in the bottom center. Through town, mainline and passing siding are separated by a considerable distance. Westbound Stacks Approaching Old Pawnee Industrial School. Black Bear Junction is a pleasant location to spend a day watching trains. You are nowhere near a town or any people. A gravel road leads from the county road onto a small hill above the diamond, where trains from both the Red Rock Subdivision (12 -20 trains per day) and the Avard Subdivision (15-30 trains per day) roar past in all directions. That the Avard Sub is now busier than the Red Rock Sub is one of life's great ironies, because the line east from Tulsa was almost abandoned by the Frisco in the 1950's. To the left and below is a map of the junction. As you can see, the Avard Sub is running due east/west, while the Red Rock Sub is angling from northeast to southwest. This is a current USGS map, yet it still identifies the lines as belonging to the Frisco and the Santa Fe! A county road runs due north-south immediately east of the junction. The gravel road turn-out is just south of the Avard tracks. About two hundred yards west of the diamond, the Avard Sub turns southwest and parallels the Red Rock Sub towards Perry. 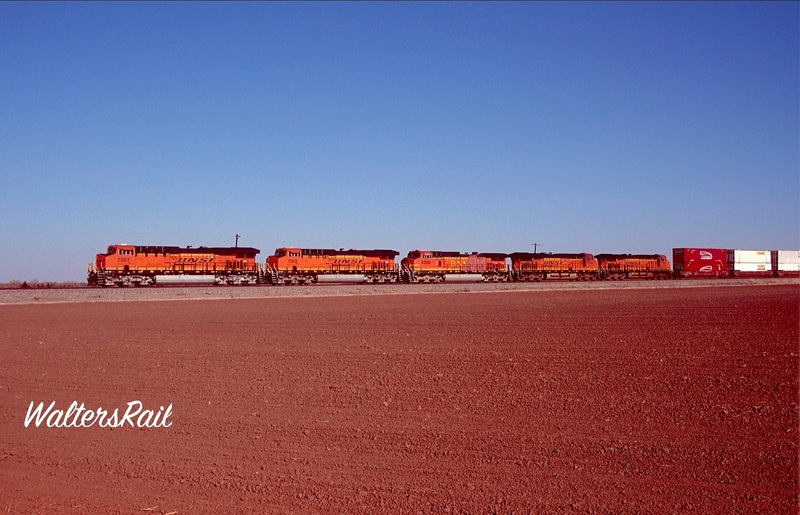 It is common to see an eastbound train on the Avard Sub stopped just short of the diamond, waiting for a train to pass on the Red Rock Sub. The junction is named for Black Bear Creek, which floods frequently. Both the Red Rock and Avard Subdivisions are just high enough out of the flood plane to avoid service outages -- except, I assume, in floods of Biblical proportions. To give you some idea of the relative safety of the junction, I have taken photographs at Black Bear (off and on) for 45 years, and I have never seen the lines closed for high water. Below are several images taken at the junction, which I hope will give some idea of the photographic possibilities. If you have read some of my other posts, you know that I travel with Bear, a/k/a Mighty Dog. 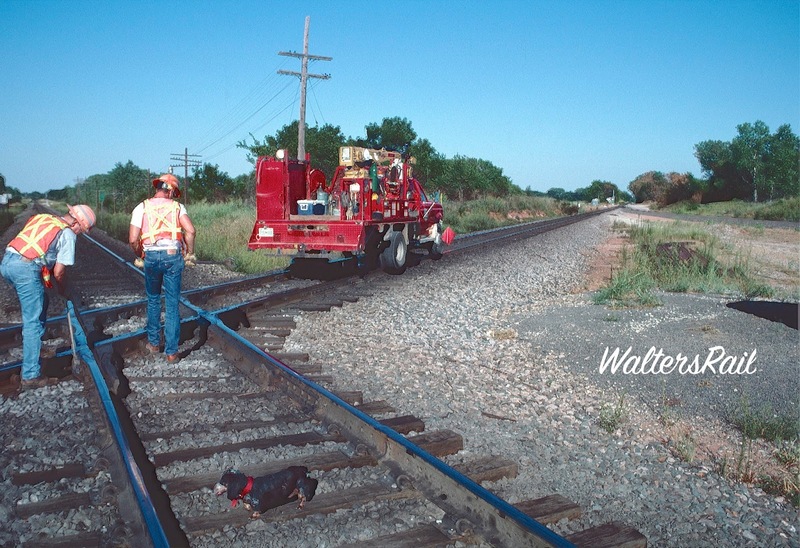 This is an image of Bear's predecessor "Snookie," a miniature dachshund carefully watching work on the diamond at Black Bear Junction. Snookie is standing on the Red Rock Sub, while the truck is sitting on the Avard Sub. To the right of the truck is the transfer track. Snookie passed many years ago. We miss him. 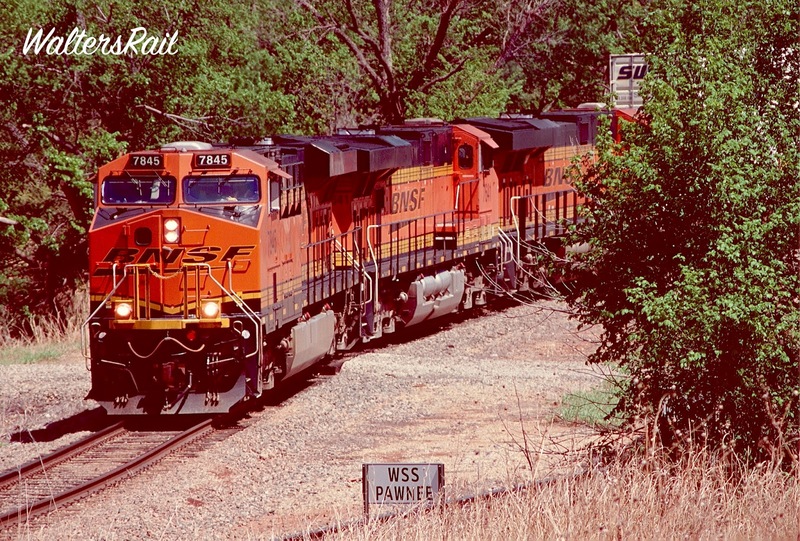 In January 1999, westbound pristine warbonnets approach the diamond to cross the Red Rock Subdivision. The transfer track, where Tulsa to Oklahoma City and Texas trains diverge from one subdivision to the other, is in the foreground. Here is how the junction looked in 1974. 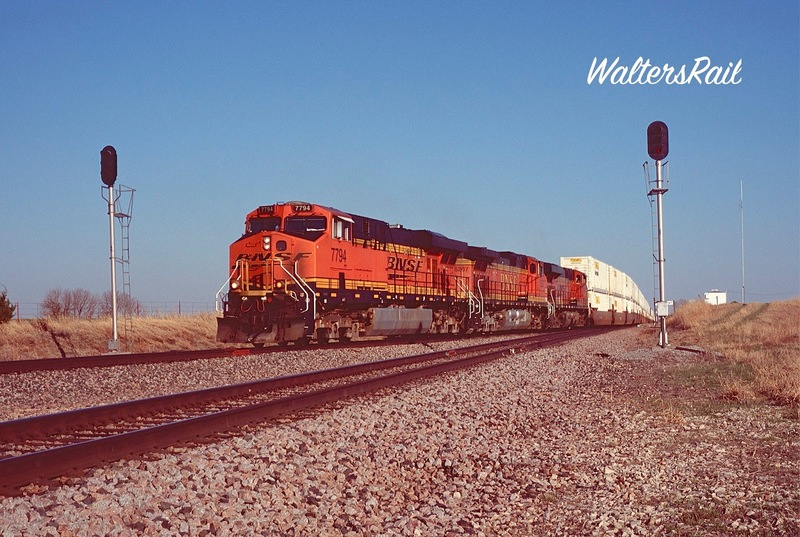 A westbound Frisco mixed train, pulled by a Santa Fe SD-45 and two SD-40's, blows by the old semaphore signal that guarded the diamond. At the time, the transfer track was little used. Left: In 2009, a westbound Z-train uses the transfer track to divert off the mainline onto the Avard Sub, while an eastbound manifest waits on the other side of the diamond for a clear board. Today, meets like this are common as Fort Worth dispatchers use the Red Rock Sub as an elongated passing side. The Z train will divert back onto the Avard Sub, using the cross-over track in Perry. This image was taken in Winter, when the sun is low in the southern sky. December through February are the best times to photograph Black Bear Junction. 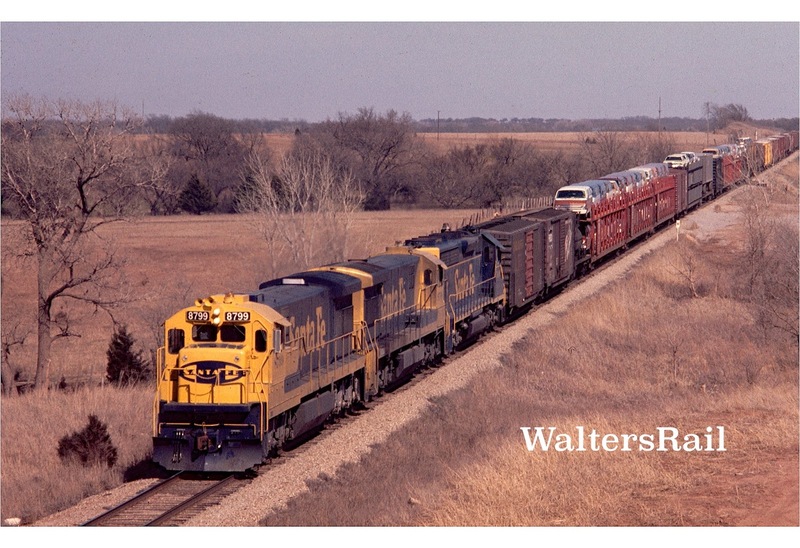 In the early 1970’s, the hottest train on the Frisco was the westbound QLA, a transcontinental train which ran from Memphis to California on the Southern, Frisco and Santa Fe lines. 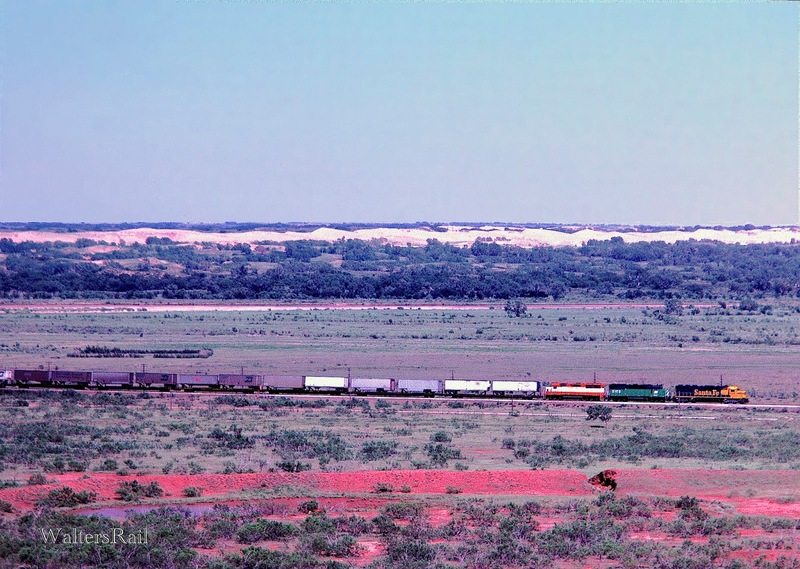 The Frisco segment ran through Oklahoma City, then southwest on a secondary main to Quanah, Texas, to interchange with the Santa Fe. 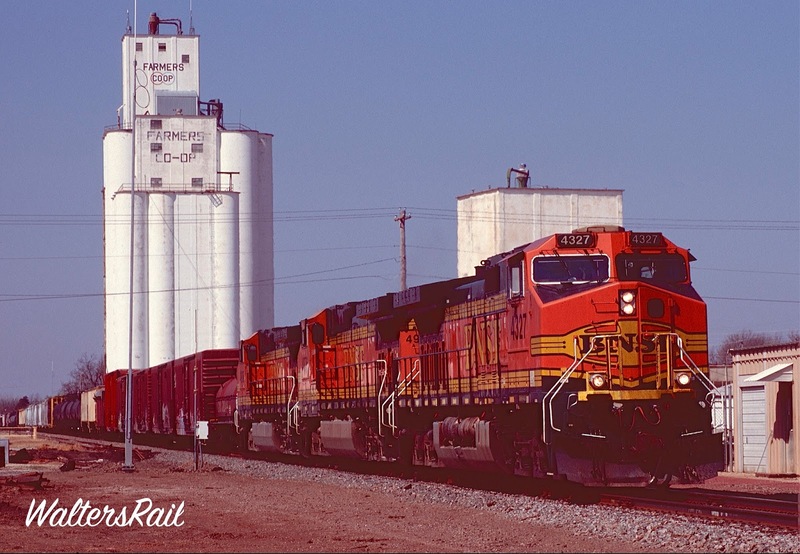 In 1973, the Frisco completely rebuilt the line from Tulsa to Avard to handle the QLA and other hot trains like the QSF, significantly shortening mileage and running time to California, as opposed to the route through Oklahoma City. The management decision to invest money was bold, given the dismal national economy. 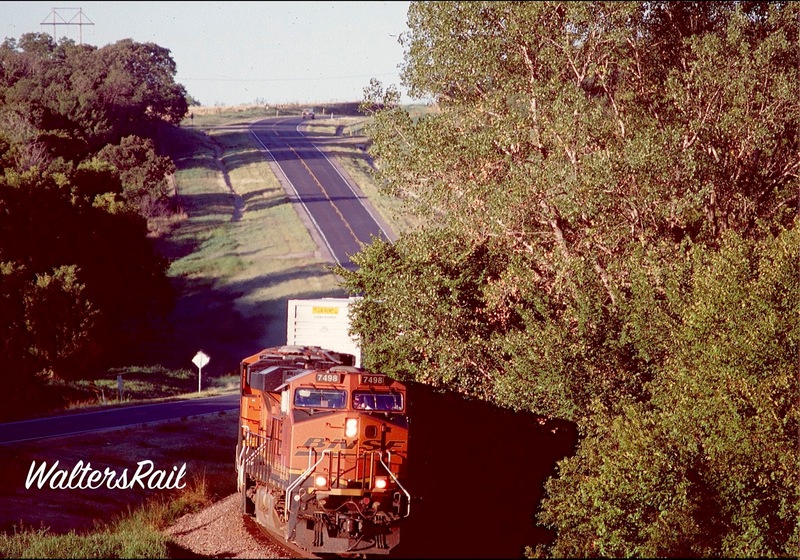 The 1970’s were not good years for American railroads. 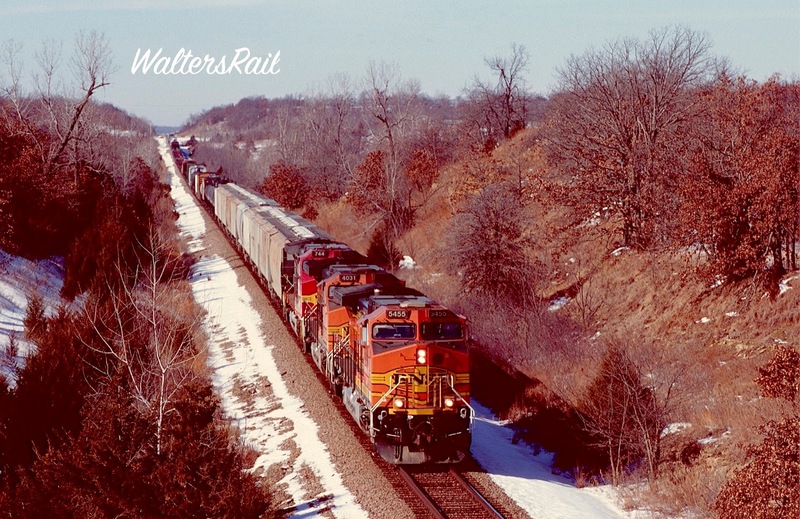 The Rock Island and Milwaukee Road were a handful of derailments away from liquidation. 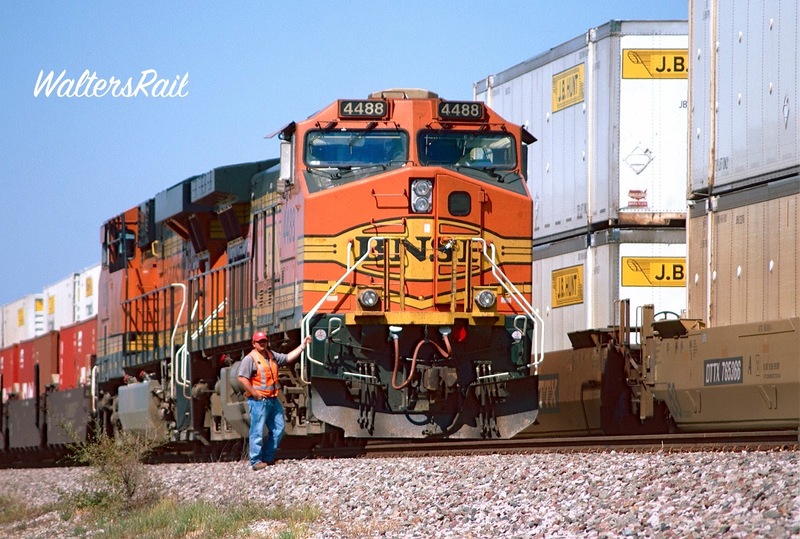 Even profitable lines like the Santa Fe and Union Pacific deferred maintenance. The Frisco’s decision to use four million dollars to rebuild the line to Avard was, in that environment, astounding. When completed, the Frisco routed as many as six transcontinental trains per day through Avard. By the mid-1970’s, Santa Fe power generally ran west of Tulsa. A casual observer would have thought the line was part of the AT&SF. 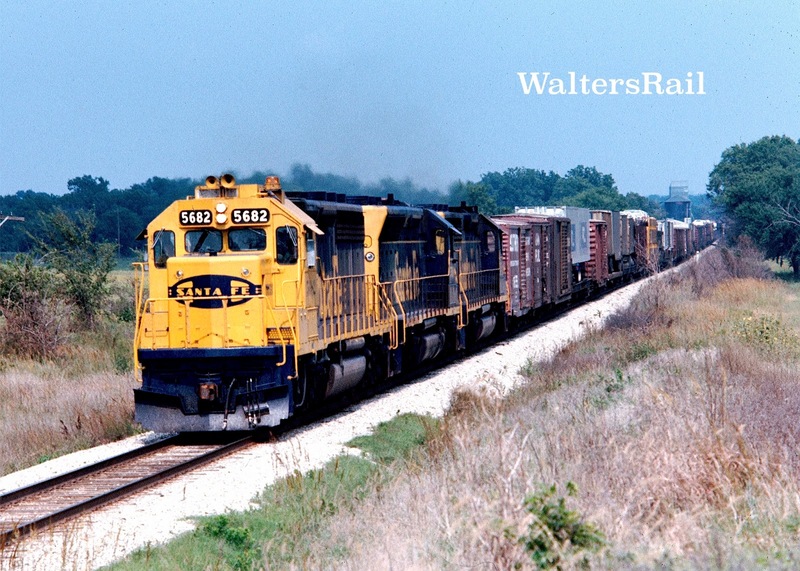 Right: AT&SF 5520 West (an SD-45) Hauls the QLA through the Osage Hills West of Tulsa in 1974. 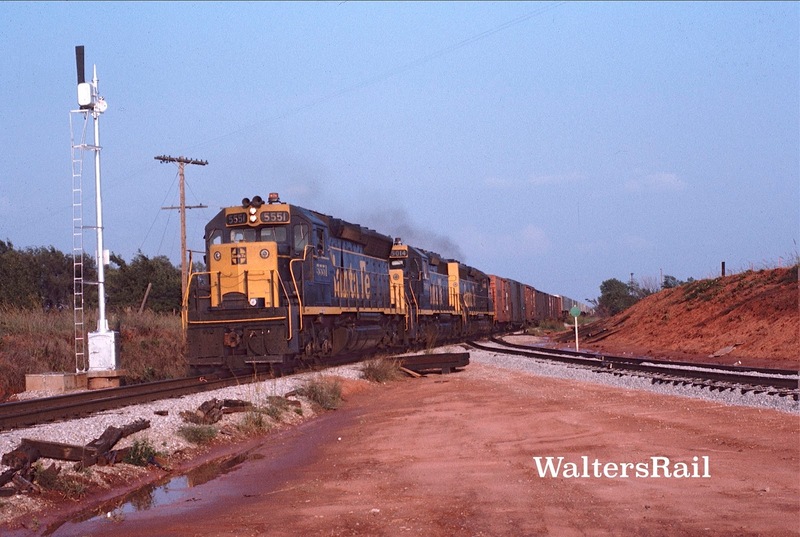 My first photographs of the Tulsa-Avard line occurred by accident in March of 1973. On a dark, cloudy morning, I had driven north of Oklahoma City to photograph the southbound Texas Chief, which had become a ward of Amtrak in 1971, was later renamed the “Lone Star” and was eventually discontinued in 1979. North of Edmond, I discovered a manifest on the ground (the only derailment I have ever seen on the Red Rock Subdivision), and I wondered what had become of the passenger train. Not having anything better to do, I followed the line north to Perry, where I discovered the stainless-steel Chief sitting quietly at the small station. What happened that day was complicated. Talking to a couple of Amtrak employees, I learned that the passengers had left the train and were taking a bus to Oklahoma City. The crew was now trying to decide what to do with the train, since the line to the south was blocked. After lengthy discussions with both Santa Fe and Frisco dispatchers, Amtrak decided to dead-head the train east to Tulsa on the Frisco line, then southwest on another Frisco line to Oklahoma City, thereby running around the derailment. To make that move, the power had to be relocated to the rear of the train, so that the Chief could run backwards (north) on the Red Rock subdivision to Black Bear Junction, where it would take the transfer track east to the Frisco line and Tulsa. 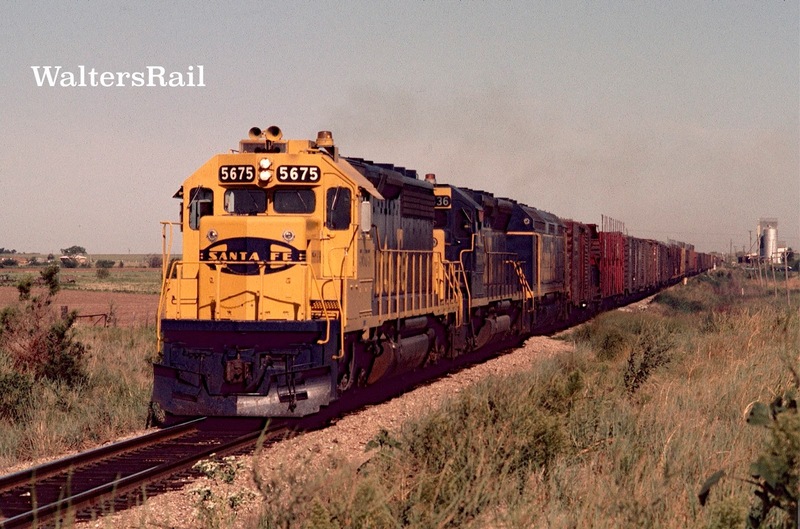 The F-units were running “elephant style” that day, however, so the Santa Fe had to provide a blue and yellow freight F-unit to connect to the power as the lead unit. A Frisco crew qualified to run the line also had to be driven to Perry. This process took several hours. Eventually the empty train headed north towards Black Bear, and I followed. Much of the Avard Subdivision northeast of Perry runs in the valley of Black Bear Creek, several miles from the main highway. I took photographs as best I could, never having seen the line before. I followed the train all the way to Tulsa, noticing that a portion of the line had already been upgraded while another portion, closer to Tulsa, was still lightweight, jointed rail waiting to be replaced by heavy welded steel, new ties and fresh ballast. Once the train reached Tulsa, it turned and ran southwest to Oklahoma City on what was then a moderately busy, single-track Frisco line protected by semaphore signals. 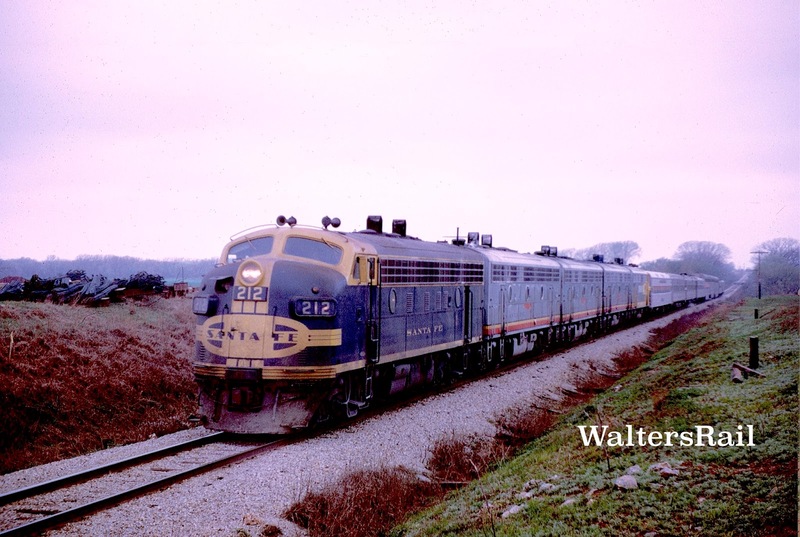 The Chief arrived in Oklahoma City at sundown, where the freight F-unit was removed, and the original power returned to the front of the train for the remainder of the trip south into Texas. To my knowledge, that was the last passenger run on the Avard Subdivision. Here is the last passenger train on the Avard Subdivision. 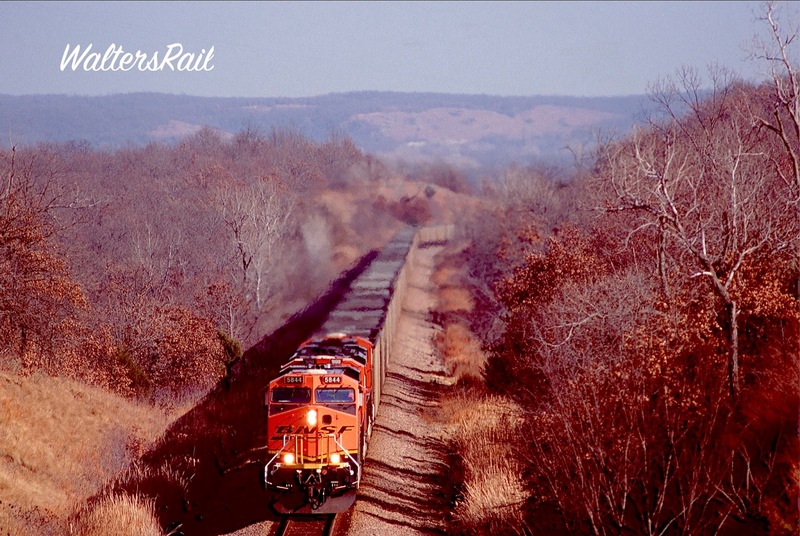 The day was dark, overcast and chilly as the empty train made its way east to Tulsa. To the left of the lead unit are some of the old ties that the Frisco had recently replaced as part of the major line upgrade. 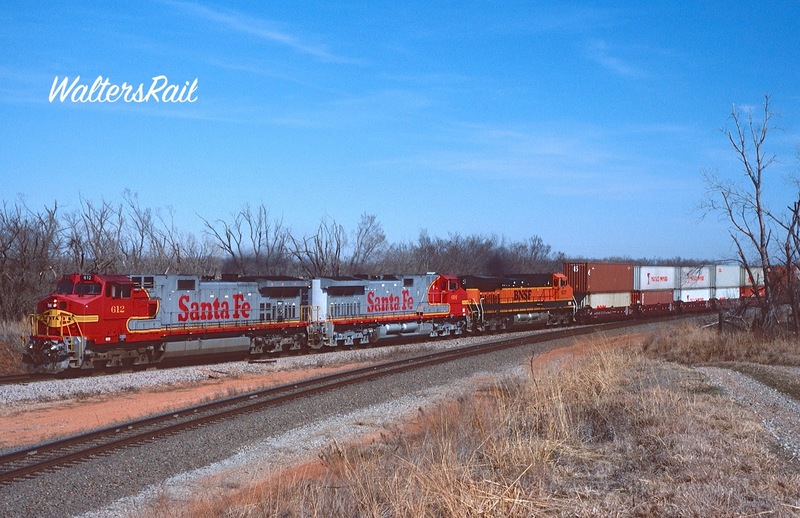 Following are a three images taken when Santa Fe power was common between Tulsa and Avard. 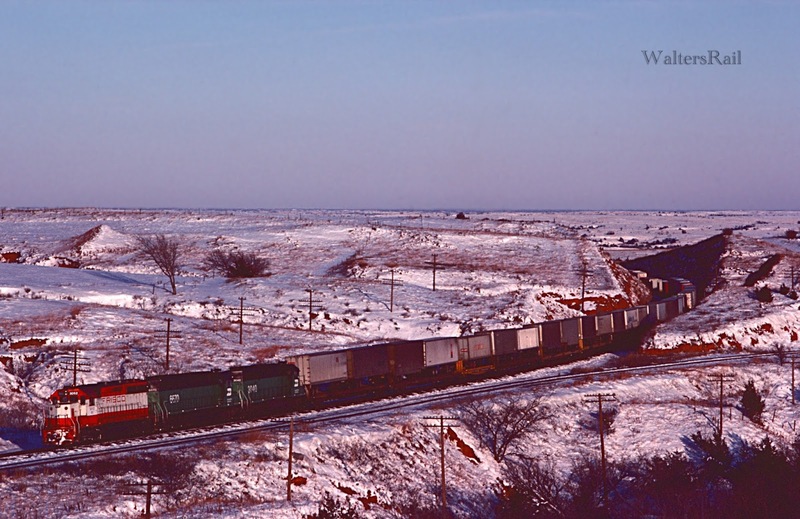 Near Morrison Oklahoma -- January 1975. 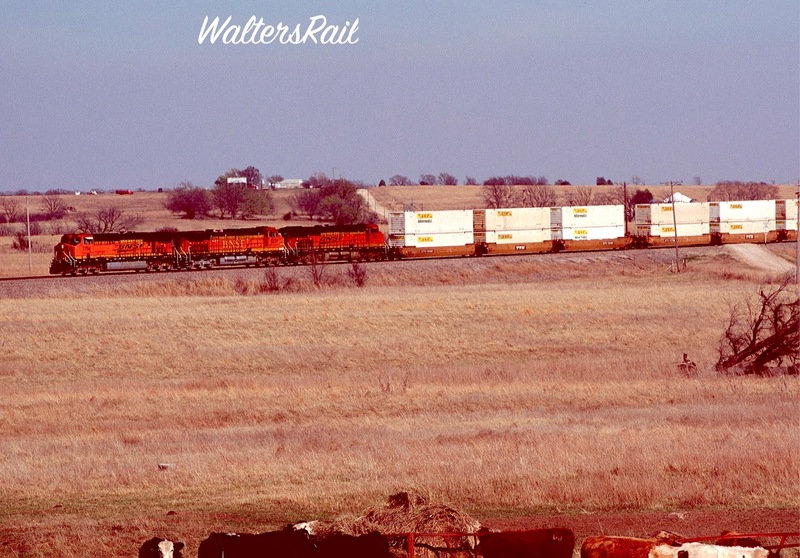 West of Covington, Oklahoma -- an SD45-2. Westbound Leaving Pawnee, Oklahoma -- Another SD45-2. 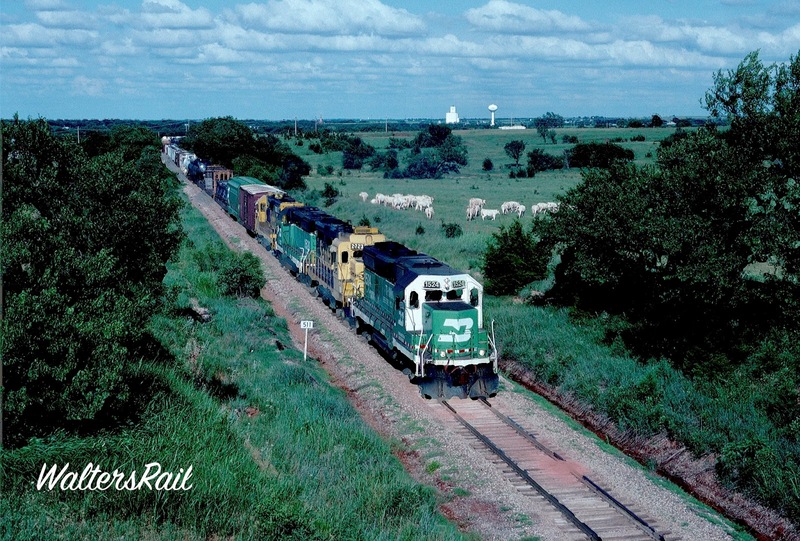 After the Burlington Northern purchased the Frisco in 1980, the new owner made additional upgrades to the Tulsa-Avard line, though nothing as monumental as the original rebuild. 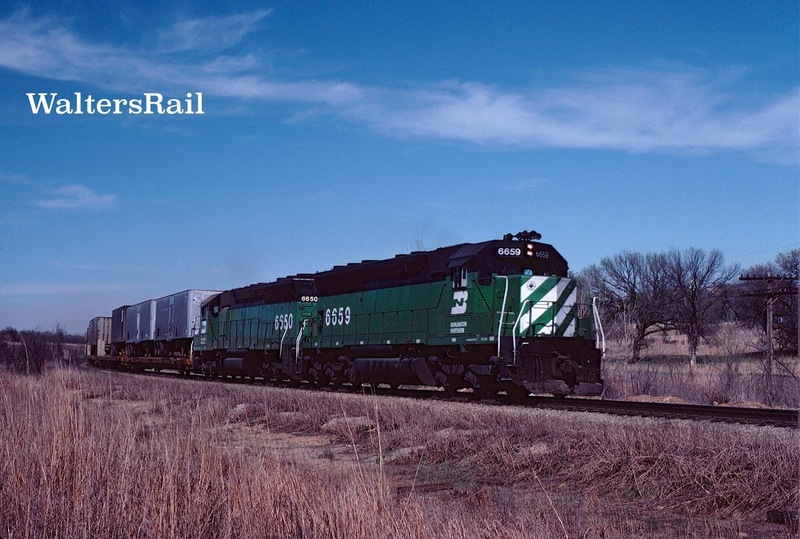 In those years, it was not uncommon to find trains pulled by a combination of Cascade Green BN and red-and-white Frisco units. 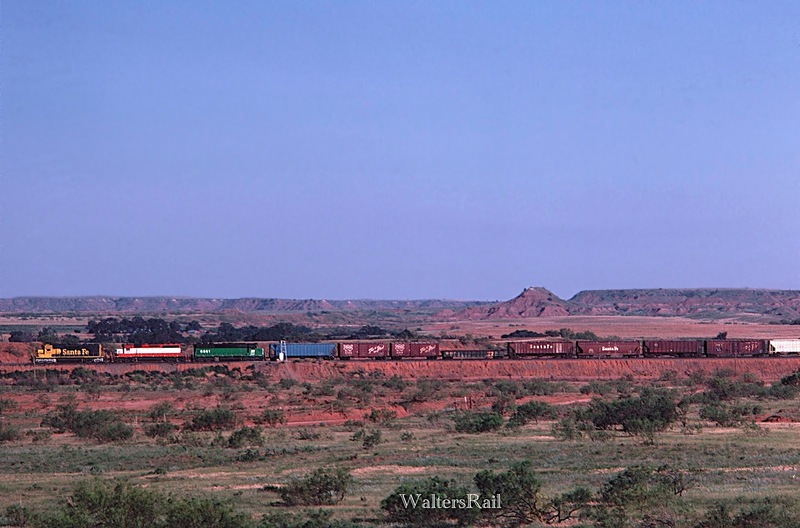 The BN and Frisco power would run west from Tulsa, enter the Santa Fe transcon at Avard and run as far west as Amarillo, where the Santa Fe usually substituted its own locomotives. I can remember seeing occasional BN and Frisco power west of Amarillo. In those days, a big thrill was to catch Frisco engines climbing Curtis Hill. Cascade Green Near Pawnee, Oklahoma -- December 1982. Mix of BN and ATSF Power at Perry -- Lead Unit is a GP-28M (I Think). 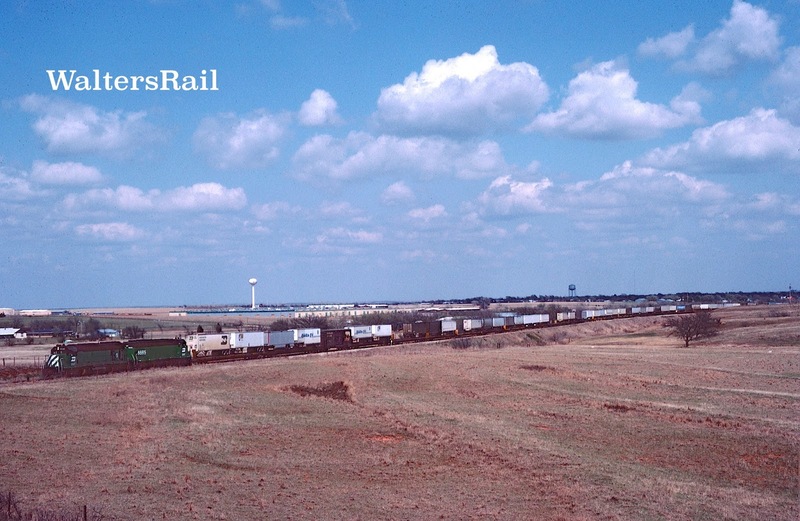 Westbound BN trailers are passing Perry, Oklahoma. 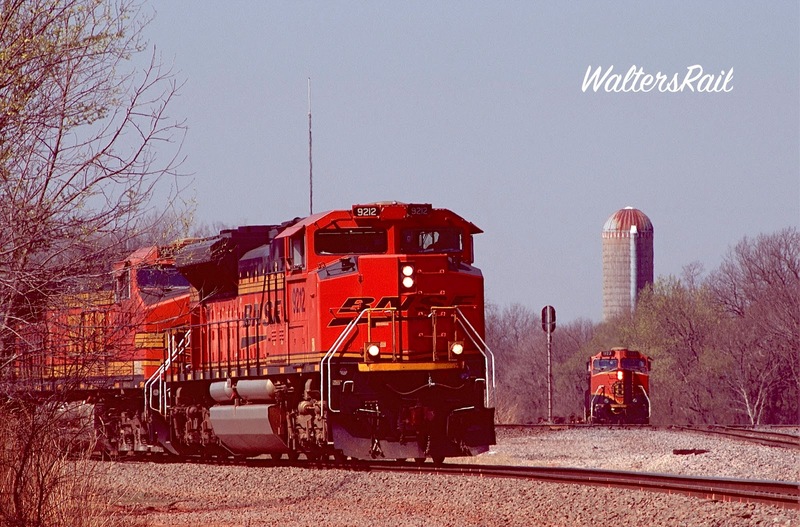 The water tower and large plant in the background are the international headquarters of Ditch Witch, Inc.
Santa Fe, Frisco and BN Power Roll East -- Toward the Avard Sub -- Down Curtis Hill on the AT&SF Transcon. More Mixed Power off the Avard Sub Has Transferred to the AT&SF Transcon Along the Sand Dunes at Curtis Hill. The Last Frisco Unit I Saw Come Off the Avard Sub -- Curtis Hill, February 6, 1982. Eastbound Stacks Pass a Crewless Train at Callahan. Before the installation of Centralized Traffic Control, the Avard Subdivision was one of the most unusual operations in the United States. The average daily train count (14-16 in 2011) would not have been a problem on a CTC-controlled line with frequent sidings and low-priority cargoes, but such was not the case at that time from Tulsa to Avard. In those days, traffic could be very heavy – manifests and grainers mixed with stack-trains and high-priority Z’s – which gave dispatchers nightmares. Most of the line was dark; trains ran on track warrants. 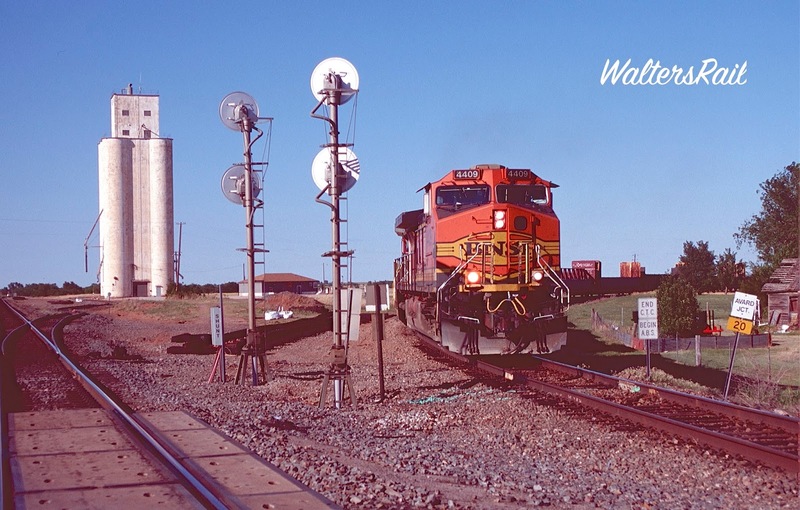 Three switches on the line – Shirk (just west of Tulsa), Hallet (east of Pawnee) and Walker (just west of Enid) -- were operated by signals generated by train crews. All other sidings were hand-thrown -- Mannford, Pawnee, Morrison, Callahan and McWillie. When a crew stopped to hand-throw a switch and enter one of those sidings, they were often given permission by the dispatcher to leave the switch in “reverse position.” The train coming in the opposite direction would then stop, and the conductor would properly align the switch for mainline traffic – called a “switch and go.” When the train “in the hole” left the siding, the dispatcher would often again give the crew permission to leave the switch in reverse position. The next train through in either direction would then execute another “switch and go” and realign the switch by hand. 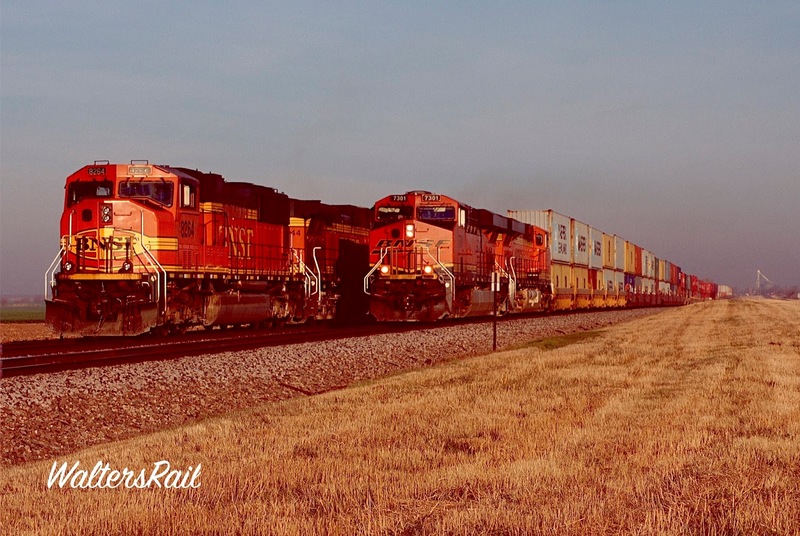 A GE C44-9W Leads BNSF 4396 East at Morrison, Oklahoma. That procedure held true even for the hottest trains on the railroad, which as of July 2011, included four Z-trains running between Los Angeles and the Southern cities of Atlanta and Memphis (ZMEMLAC and ZLACATG, for example). Only slightly less time sensitive were St. Louis and Atlanta Q-trains such as the QSTLLAC and the QLACATG. It was one thing to delay a coal drag or a dumpy manifest, but quite another to require Z-train crews to hand throw switches and wait in sidings or on the mainline for hours for approaching trains or for clearing traffic ahead, situations I witnessed many times. The hand-thrown switches contained monitoring equipment that allowed the dispatcher in Forth Worth to see the switch position, even though he could not control it. On several occasions, I heard dispatchers, uncertain of a switch’s position because of a malfunctioning circuit, require trains to stop at hand-thrown switches to make certain the alignment was proper, even though no meet was in progress. Eastbound at Perry in January. 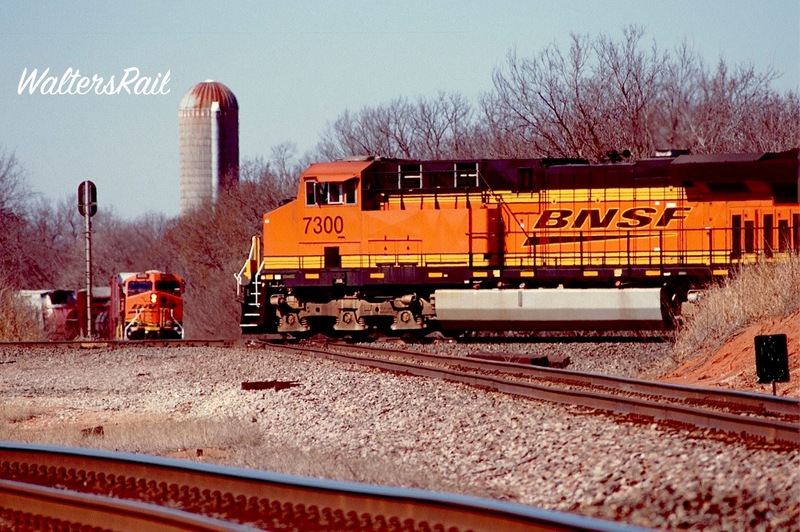 In 2012, BNSF began conversion of the Avard Sub to Centralized Traffic Control. The project was completed in segments from east to west. For a period of about one year, western portions of the line continued to be dispatched by track warrant, while eastern portions were controlled by the new centralized system. Where before the subdivision had been “dark,” signals were now installed, often at locations where train crews could read them in both directions. New technology allowed data to be sent through the rails, so there was no need to install telephone poles or wires. Signaling equipment was brought to site by both work trains and trucks and installed by a small number of men. Watching the process, I was amazed by how much modern technology has reduced the need for human involvement. Once fully installed, traffic dramatically increased on the Avard Sub. Today, during busy times, the line may see as many 30 trains every 24 hours. Total meltdowns have disappeared. Another Meet at Shirk -- Lake Keystone in Background. Below: A Meet at Walker. There are two short segments on the Avard Subdivision which operate as double-track mainline, the first being Perry to Black Bear. This section, from the middle of Perry to Black Bear Junction northeast of town has been CTC for years. Before the major CTC project, trains coming east were given warrants to Perry and were required wait for a signal before proceeding. Trains coming west were given warrants to Black Bear and also often waited for a clear board, especially if a train were arriving north or south on the Red Rock Subdivision. 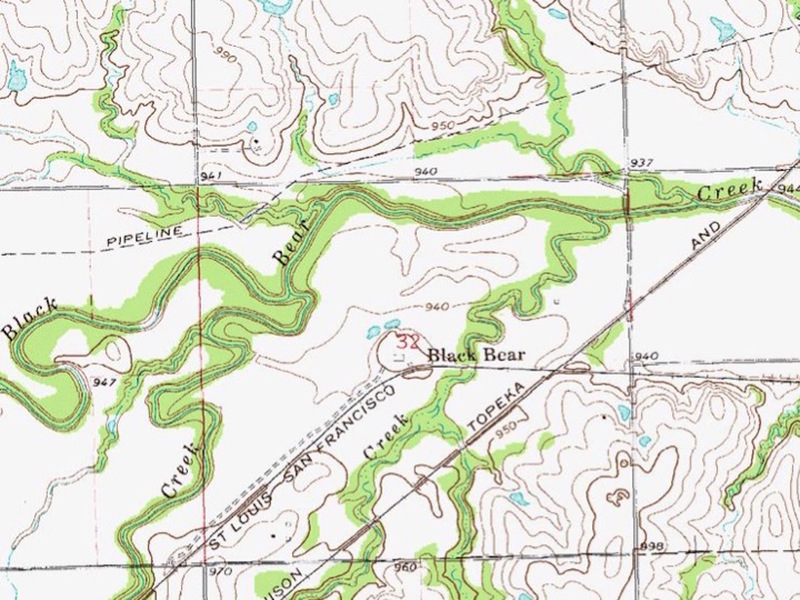 The USGS map on the right shows how the two subdivisions run side-by-side from Black Bear Junction into Perry. The Perry-Black Bear stretch operated then and still operates like double track, because at both ends, trains on the Avard Subdivision can be diverted onto the Red Rock Sub. 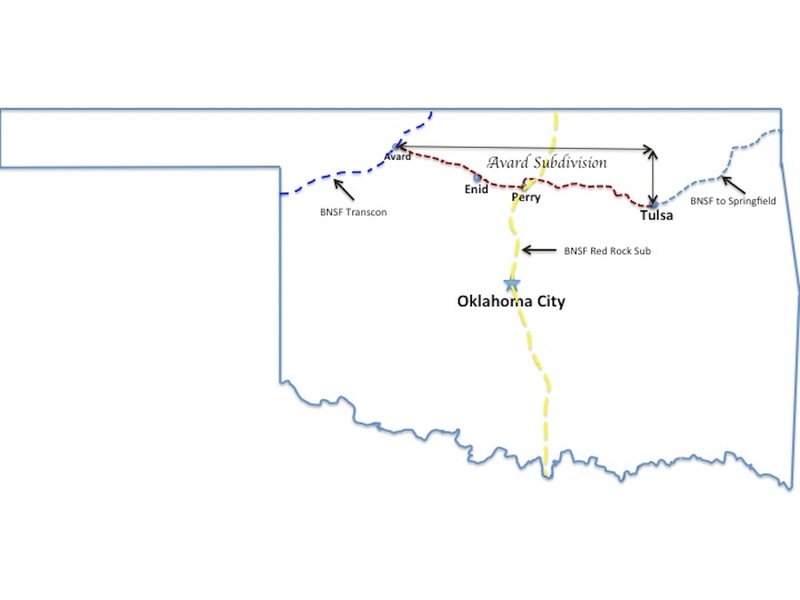 For example, a train coming east from Enid may take the cross-over track onto the Red Rock Subdivision, while a train coming west from Tulsa will stay on the Avard Sub. The two trains will pass somewhere between Perry and Black Bear. The westbounder will stay on the main, while the eastbounder will transfer back to the Avard Subdivision at Black Bear. When traffic is exceptionally heavy, I have seen the dispatcher stop as many as three eastbound trains on the Avard Subdivision at Black Bear Junction, one right behind the other, to wait for a westbound train to clear on the transfer track and head to Perry on the Red Rock Sub. 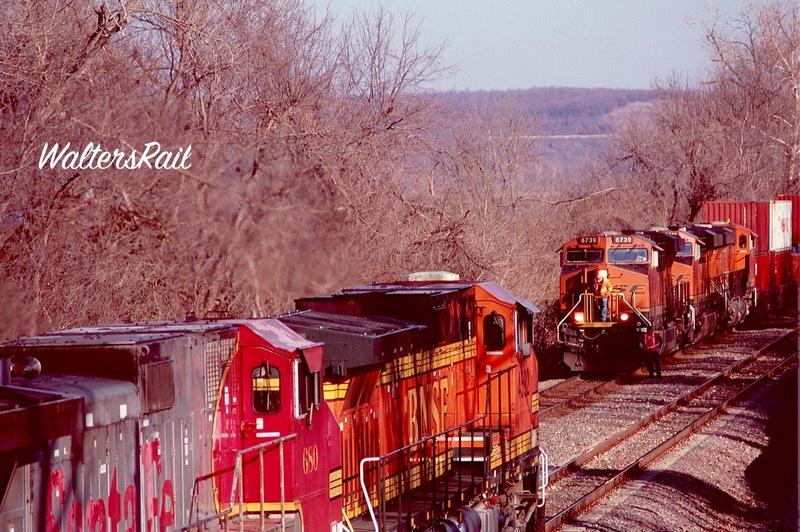 A Southbound Crosses the Diamond on the Red Rock Sub While an Eastbound Waits on the Avard Sub for a Green Signal. 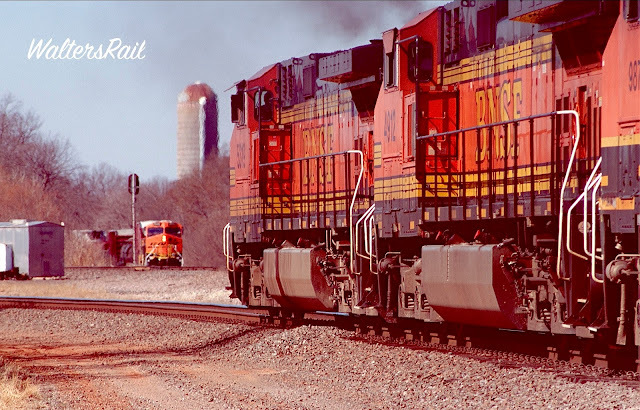 A Temple (Texas) to Tulsa Manifest, Led by an SD70ACe, Transfers off the Red Rock Sub onto the Avard Sub, While Another Manifest Waits Behind the Diamond. 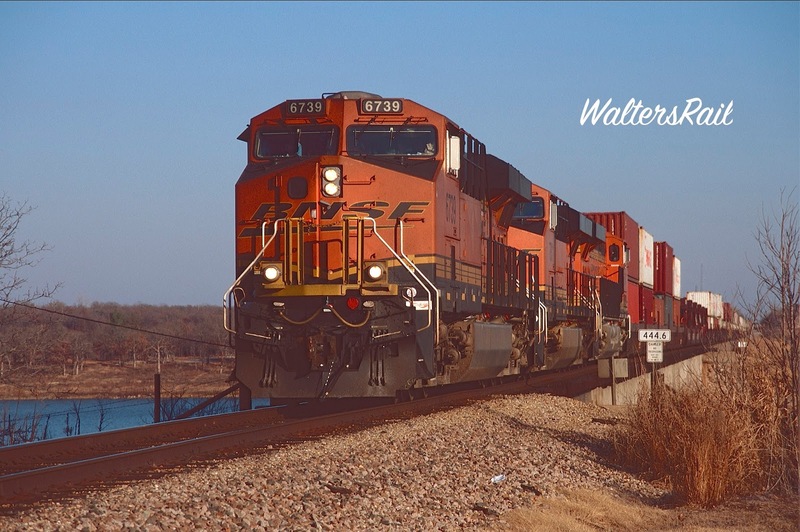 Westbound Stacks That Have Transferred onto the Red Rock Sub for a Meet Are Now Transferring Back to the Avard Sub in Perry, Oklahoma. The other segment of double-track, at Enid, is the amalgamation of what were once two separate railroads. 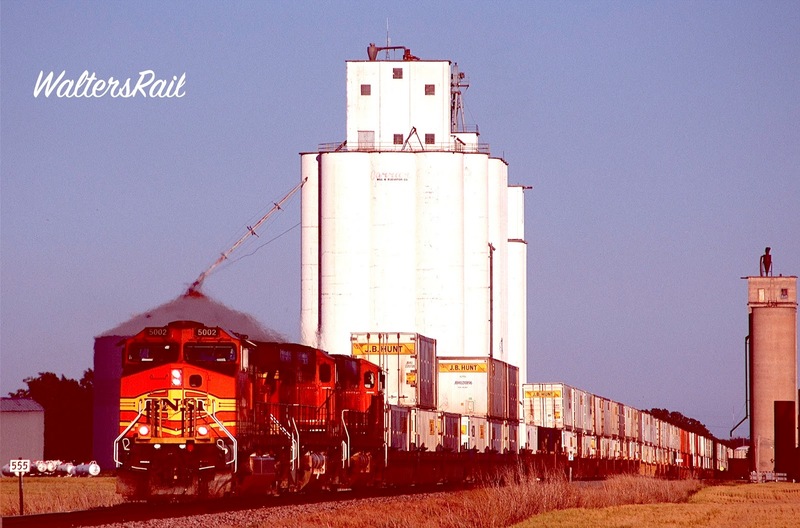 Years ago, the Santa Fe accessed the town, one of the largest wheat terminals in the nation, by a branch line running northwest from Guthrie. 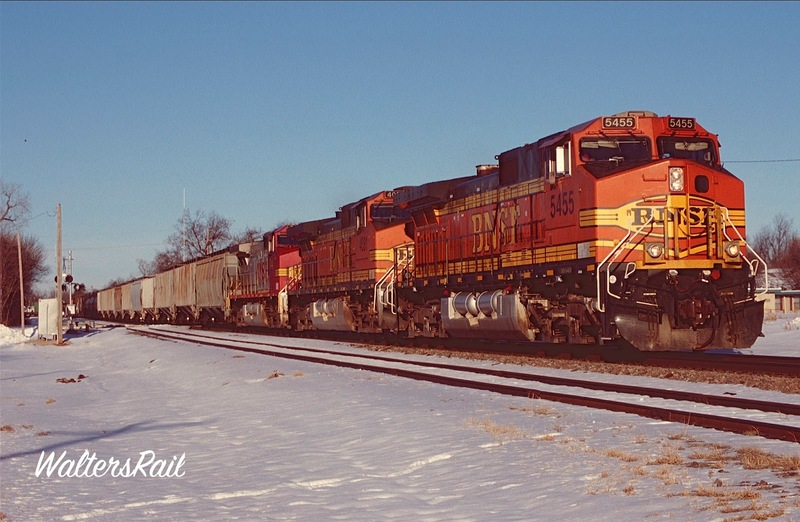 When the Santa Fe merged with the Burlington Northern, the Guthrie line became redundant, since BNSF trains from the north and south could access Enid on the Avard Sub via Black Bear. The line from Guthrie was embargoed to the junction with the old Tulsa-Avard Frisco line at Fairmont. From that junction into Enid, about ten miles, both lines now remain open. Main One is the old Santa Fe. Main Two is the old Frisco. Trains will often meet on this double-track segment, westbounders on Main One, eastbounders on Main Two. 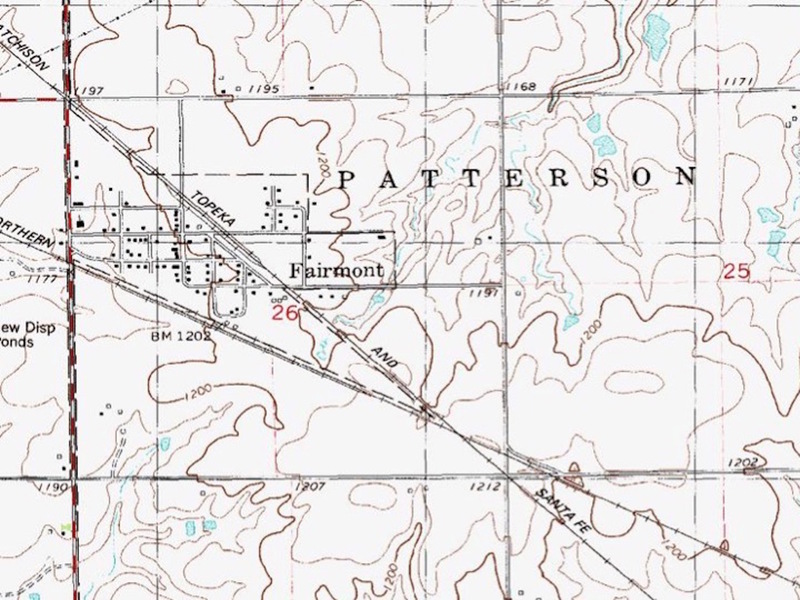 The USGS map on the left shows the small hamlet of Fairmont, with about ten houses and one Baptist Church, surrounded in all directions by wheat fields and oil wells. 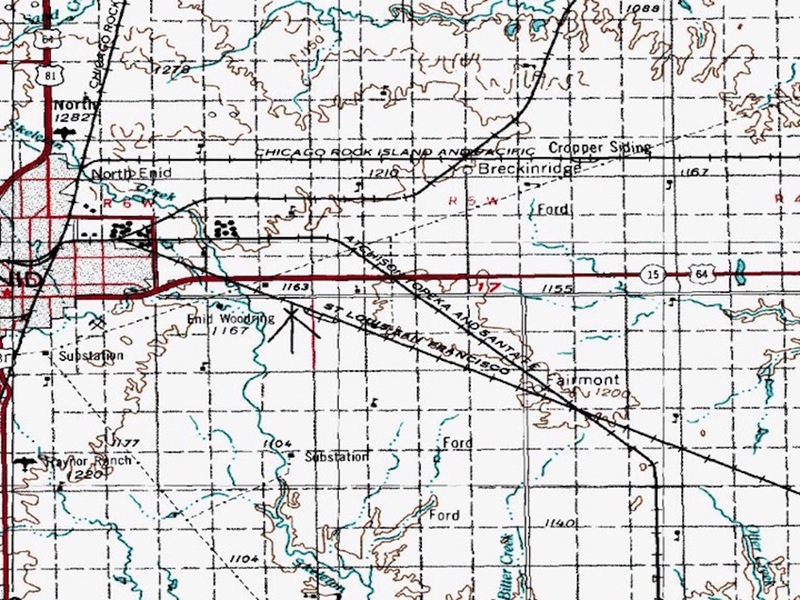 Just southeast of the settlement, the original AT&SF line (still so labeled) crossed the original Frisco line (labeled "Burlington Northern"). The old Santa Fe line south of the junction is gone. 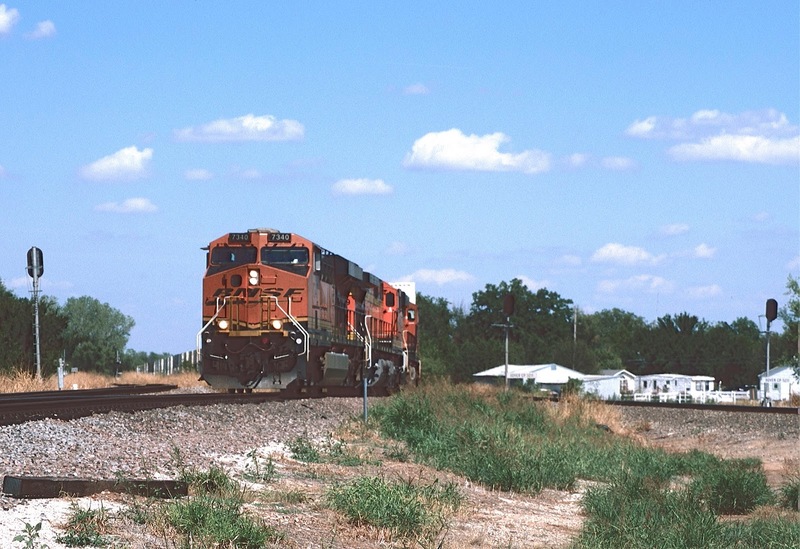 The image below shows a westbound stack train diverging off the old Frisco line onto the old Santa Fe line at a location that the railroad calls "Double Track Fairmont." USGS Map Showing the Extent of Double Track Fairmont. Notice that both lines are misnamed. The two branch lines in the northeast quadrant were both abandoned years ago. Eastbound Stacks are Coming off the Passing Siding at McWillie. A Westbound Re-Routed Coal Train Passes the Grain Elevator in Perry. Avard, the western end of the subdivision, is one of the most forlorn places you will ever see. “Place” is probably too grand a word to describe it. The junction with the transcon sits at 98°47´24´´W, perilously close to the One Hundredth Meridian, often considered the beginning of the arid West. The two hundred miles or so east of the One Hundredth are sometimes called the “sub-humid zone,” meaning an area that sometimes receives adequate rain and sometimes does not. In my experience, that part of the world receives enough rain in some years to support small settlements and ranches, and in other years doesn’t receive enough rain to fill a teacup. Weather can thus be very harsh. 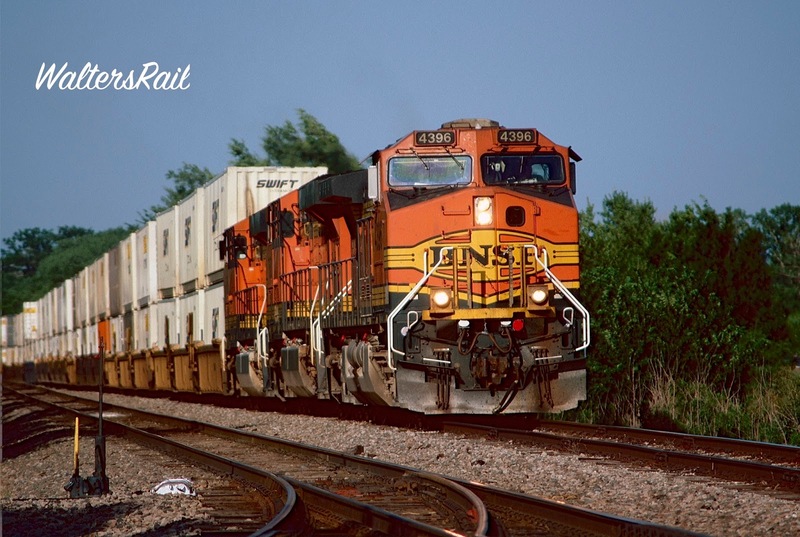 Here a low priority manifest is preparing to transfer to the BNSF Transcon at Avard Junction. Since this image was taken, the entire Subdivision has been upgraded to CTC, and the "End CTC" sign has been removed. The Avard post office was established in 1895, and the town was incorporated in 1904 when the Arkansas Valley and Western tracks reached the Santa Fe. The town was named for Isabell Avard Todd, the wife of the first postmaster. At one time, Avard supported two hotels, a bank, a livestock auction and a grain elevator. A weekly newspaper, the Avard Tribune, was published from 1904 to 1918. When cattle were shipped by rail, Avard was a major loading point. Today almost nothing is left. The grain elevator looks abandoned. There is not a single commercial establishment of any kind. About ten disheveled houses appear occupied. Another ten or so appear to have been unoccupied for years. Whenever I go there, I am followed by a pack of barking dogs, making rail photography difficult. The junction itself is directly in the middle of what used to be the main street. You can stand in the road to take photographs without fear of automobile traffic. The two constants in Avard are wind and dust. All else, even the railroad, is transitory. 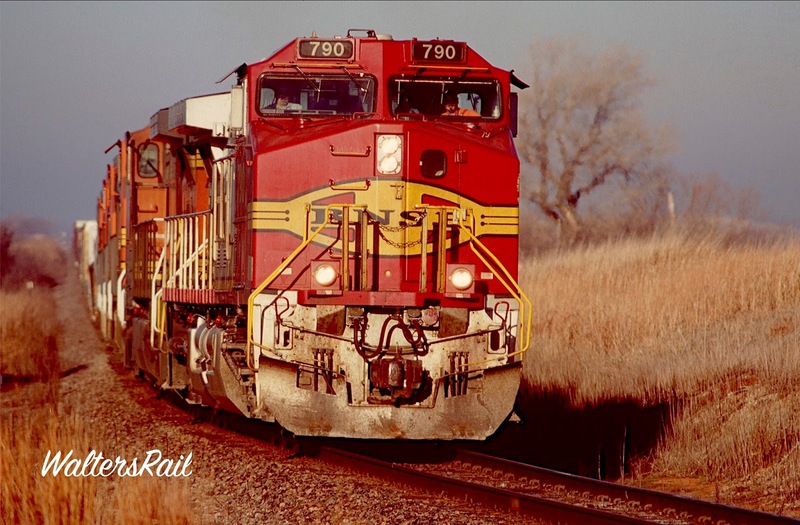 BNSF 7067 West Roars Toward Avard Beside the Distinctive Red Soil of Western Oklahoma. 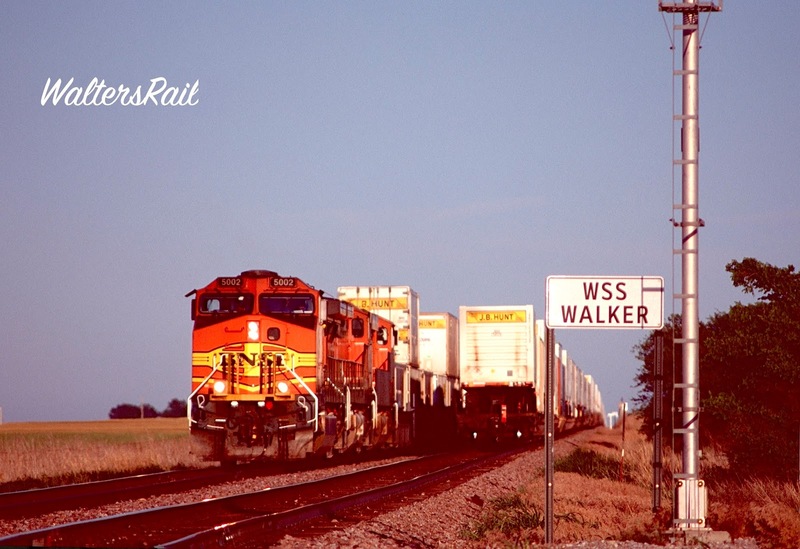 A Pristine Warbonnet Rolls Past Lucien. West of Perry, the Avard Subdivision runs directly south of a small country cemetery called Lucien, where many of my mother’s relatives are buried. Every Memorial Day, we drive there to decorate the graves. My two favorite relatives, both of whom died years before I was born, are Big Swede and Little Swede. Big Swede died in a train derailment, while Little Swede jumped into a pile of hay and accidentally impaled himself on a pitchfork. I always put the most flowers on their graves. The flowers are artificial. We come back in a week to retrieve them. Sometimes they have blown away. I don’t know why we keep doing this. Sometimes a train passes. I would like to be buried in Lucien. 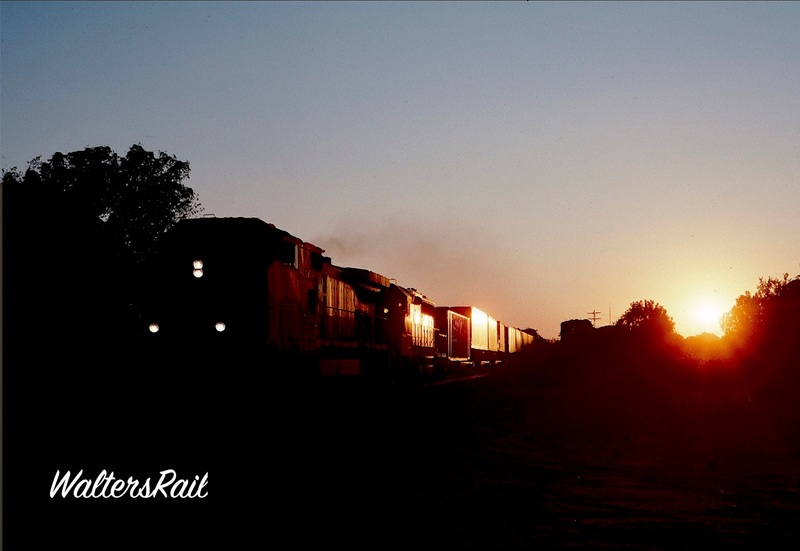 The Sun Sets at Black Bear Junction. So there you have it -- the Avard Subdivision from Tulsa to Transcon -- an interesting and little-known piece of twenty-first century railroading. I hope you enjoyed the tour.